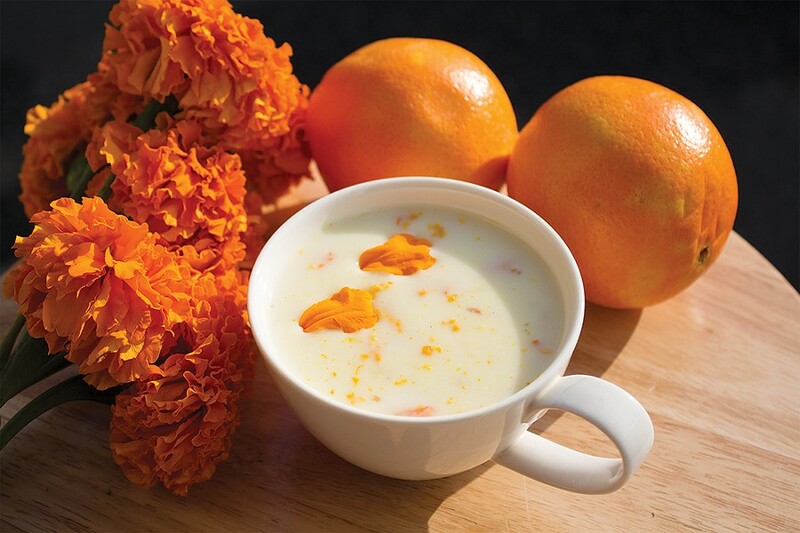 Photo by Héctor Alejandro Arzate Atole with orange zest and marigold petals. 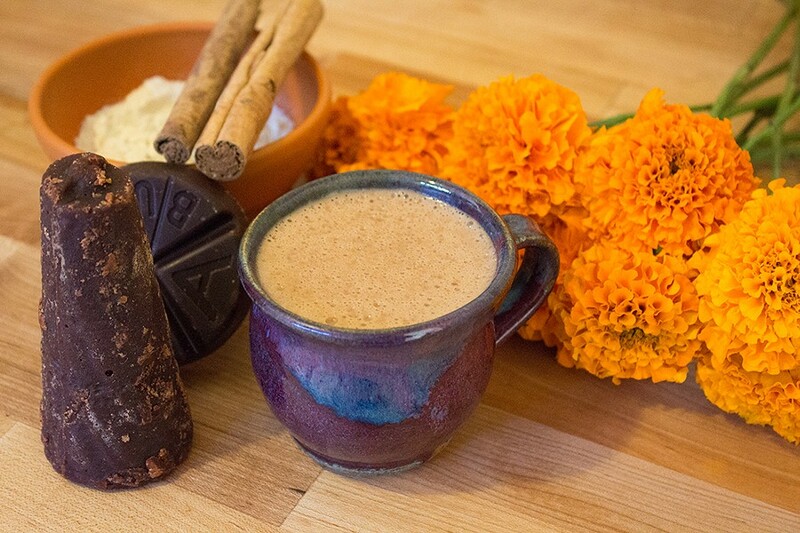 Photo by Héctor Alejandro Arzate Chocolatey champurrado to warm your soul. As the weather gets colder, the drinks get warmer. While I do appreciate a good seasonal drink, I'm not talking about pumpkin-spice-anything. It's time to let atole warm up your heart. For those unfamiliar with atole (pronounced ah-TOH-leh), it's a corn-based drink made throughout Mexico and Central America. With origins dating back to pre-Hispanic Mesoamerica, it's a traditional hot beverage that was prepared by grinding corn and mixing it with water. Today, it's typically enjoyed during the holidays with a wide variety of flavors like guava, pineapple and orange, as well as chocolate. Some are made with whole corn, others with masa harina, and many with cornstarch, but all are just as rich and heartwarming. In parts of Michoacán and Guanajuato, where my mother and grandparents lived, the lesser-known puscua, an atole made with white corn, is usually prepared with chocolate and piloncillo, a cone of unprocessed sugar. Sometimes folks will even break off pieces of the piloncillo and eat it while drinking puscua. So when I told my mom I wanted to make a variation of atole called champurrado (pronounced chahm-poo-rah-doe), she knew it by both names. Whatever you call it, it has been a staple drink across what is now called the Americas. In my family we usually enjoy our atole with tamales throughout the fall and winter. If you could walk into our busy kitchen, you would find my mom and mi mama Chelo steaming tamales in a massive pot, along with a fresh batch of cornstarch atole de piña sitting on the stove. For me, food and drink have always been a way to connect with my family and living ancestors. Being away from them, I feel a sense of nostalgia and longing that can only be satisfied with a satisfied belly. Hopefully, you can take part in a delicious tradition and celebrate the season with a warm taza of atole and maybe even a plate of tamales. You'll do well to find piloncillo and canela, softer Mexican cinnamon sticks, at your local Latino markets like Fregoso's in Arcata or La Pasadita in Eureka. Most grocery stores carry Mexican hot chocolate tablets such as Ibarra or Abuelita. Traditionally, a molinillo or wooden whisk is used to prepare atole, but a regular whisk works fine. Best served on a cold morning with pan dulce (sweet Mexican buns) or a simple loaf of crusty, white bolillo bread, also called birote. In a large stockpot, heat the milk over medium heat. Add the cinnamon stick and optional spices. Once the milk starts to steam, add the chocolate tablet along with the piloncillo cone. Reduce the heat to low and stir frequently with a whisk. Fill a separate bowl with the water and sift the masa harina into it using a strainer to prevent clumps. Whisk the bowl until it forms a thick but runny liquid. Check the stockpot to see if the piloncillo and tablet have dissolved, and continue to whisk. Once they are dissolved, combine the masa mixture with the hot chocolate. Raise the heat back to medium. Add the evaporated milk and continue to whisk the stockpot for about five minutes before cutting the heat. Let the champurrado cool for 5 minutes before serving. The champurrado should be thick enough to coat the back of a spoon or ladle. If there are clumps, pour it into a blender and pulse for a few seconds. While it may sound weird at first to eat flowers, marigolds are edible and frequently used in cooking. However, you'll want to wash the flowers before cooking with them and avoid any that may have been treated with pesticides. If you're unsure, avoid using the flowers altogether. This drink is perfect if you're not big on chocolate. In a stockpot, bring the water to a boil and add the cloves and flower petals. Once it's boiling again, add the sugar and orange juice. Stir with a whisk until the sugar completely dissolves. In a separate bowl, combine 1 cup of the milk with the cornstarch and whisk until completely combined. Add the remaining milk to the pot. Once it's steaming, introduce the cornstarch mixture and vanilla extract. Reduce the heat to medium. Continue whisking until smooth. Let the atole cool for at least 5 minutes before serving. 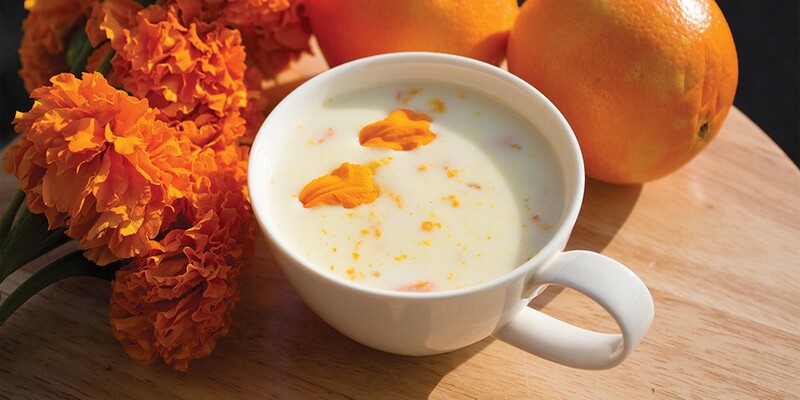 Garnish with the zest of an orange and enjoy. Héctor Alejandro Arzate is a Scorpio originally from Richmond, California. When he's not writing, you can find him cooking or working on his jump shot.